“Our Town” is one of the most familiar plays in the American canon. Wilder’s masterpiece is too often dismissed as old fashioned, sentimental and essentially shallow, presenting a warped and overly positive view of small town life. That’s nonsense. With “Our Town”, Wilder stood with Bertold Brecht in the creation of a new approach to theatre, one in which narrative is undermined by the famous “alienation effect” to encourage audiences to analyze what they see, and not just wallow in sentimentality. The absence of set, the presence of an all-knowing narrator who speaks directly to the characters, acknowledging them as actors, the talking dead — there is a great deal here that is easily missed in the sentimental glow of nostalgia. Also, Wilder does not ignore the dark side of Grovers’ Corners, referencing the segregation of the Catholic community, the absence of women’s rights and including an alcoholic character who may be a musical genius and a homosexual, and who commits suicide. Another character simply comments, “Not everyone is suited for small town life”. All of this is not lost on director Susannah Martin, who discusses these matters in carefully considered program notes, and makes numerous decisions in staging to encourage the audience to think through some of the play’s implications and break away from stultifying sentimentality. The production is by no means a failure, but it does not fully succeed in realizing the depths of the play. Some wise choices include the placing of characters in the audience, color- and gender-blind casting, and the incorporation of a well composed musical score. The haunting design which nicely evokes passing seasons and night skies is beautifully effective. On the other hand, the actors’ performances overall seem to be straight-jacketed by sentimentality and nostalgia, in spite of the best intentions. All of the actors have moments when they seem to escape the jacket, but these are few and far between. Josh Schell, as George Gibbs, seems the least constrained, especially in scenes courting the young Emily Webb. Molly Noble as Mrs. Gibbs offers some of the evening’s most affecting and authentic moments when speaking from the grave. This is capable professional work which will please many who delight in this much beloved play, but others (myself included) might wish for less sentiment and more authentic life. For futher information, click here. 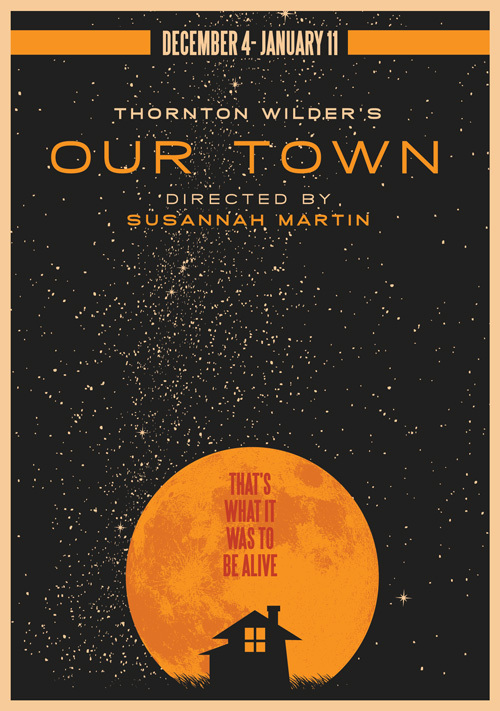 “Our Town” by Thornton Wilder. Director: Susannah Martin. Set: Nina Ball. Lights: Heather Basrab. Music Direction: Abigail Nessen Bengson & Shaun Bengson. Sound Design: Theodore J. H Hulsker. Wardrobe: Ashley Rogers. Emily Webb: El Beh. Stage Manager: Madeline H. D. Brown. Mrs. Soames/Ensemble: Sam Jackson. Doc Gibbs: Tim Kniffin. Professor Willard/Ensemble: Christine Macomber. Howie Newsome/Ensemble: Wiley Naman Strasser. Mrs. Gibbs: Molly Noble. Rebecca Gibbs/Ensemble: Karen Offereins. Constable Warren/Ensemble: Valerie Fachman. George Gibbs: Josh Schell. Mrs. Webb:Michelle Talgarow. Simon/Ensemble: Christopher W. White. Joe/Si Crowell/Sam Craig: Eli Wirtschafter. Mr. Webb: Don Wood. Posted in Reviews.Tagged Charles Kruger, Christine Macomber, Christopher W. White, Don Wood, El Beh, Eli Wirtschafter, Josh Schell, Karen Offereins, Madeline H. D. Brown, Michelle Talgarow, Molly Noble, Nina Ball, Our Town, Sam Jackson, San Francisco Theatre Reviews, Shotgun Players, Susannah Martin, theatrestorm, Thornton Wilder, Tim Kniffin, Valerie Fachman, Wiley Naman Strasser.